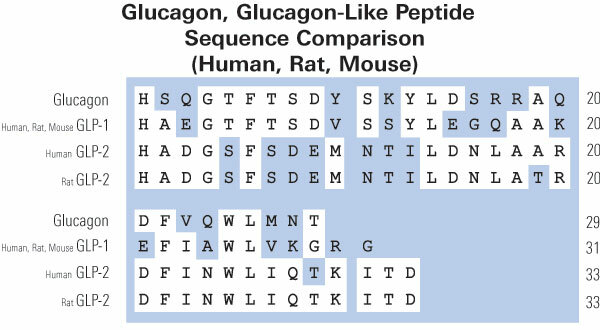 GLP-1(28-36)amide, the Glucagon-like peptide-1 metabolite: friend, foe, or pharmacological folly? The glucagon-like peptide-1 (GLP-1) axis has emerged as a major therapeutic target for the treatment of type 2 diabetes. GLP-1 mediates its key insulinotropic effects via a G-protein coupled receptor expressed on β-cells and other pancreatic cell types. The insulinotropic activity of GLP-1 is terminated via enzymatic cleavage by dipeptidyl peptidase-4. Until recently, GLP-1-derived metabolites were generally considered metabolically inactive; however, accumulating evidence indicates some have biological activity that may contribute to the pleiotropic effects of GLP-1 independent of the GLP-1 receptor. Recent reports describing the putative effects of one such metabolite, the GLP-1-derived nonapeptide GLP-1(28-36) amide, are the focus of this review. Administration of the nonapeptide elevates cyclic adenosine monophosphate (cAMP) and activates protein kinase A, β-catenin, and cAMP response-element binding protein in pancreatic β-cells and hepatocytes. In stressed cells, the nonapeptide targets the mitochondria and, via poorly defined mechanisms, helps to maintain mitochondrial membrane potential and cellular adenosine triphosphate levels and to reduce cytotoxicity and apoptosis. In mouse models of diet-induced obesity, treatment with the nonapeptide reduces weight gain and ameliorates associated pathophysiology, including hyperglycemia, hyperinsulinemia, and hepatic steatosis. Nonapeptide administration in a streptozotocin-induced model of type 1 diabetes also improves glucose disposal concomitant with elevated insulin levels and increased ?-cell mass and proliferation. Collectively, these results suggest some of the beneficial effects of GLP-1 receptor analogs may be mediated by the nonapeptide. However, the concentrations required to elicit some of these effects are in the micromolar range, leading to reservations about potentially related therapeutic benefits. Moreover, although controversial, concerns have been raised about the potential for incretin-based therapies to promote pancreatitis and pancreatic and thyroid cancers. The effects ascribed to the nonapeptide make it a potential contributor to such outcomes, raising additional questions about its therapeutic suitability. Notwithstanding, the nonapeptide, like other GLP-1 metabolites, appears to be biologically active. 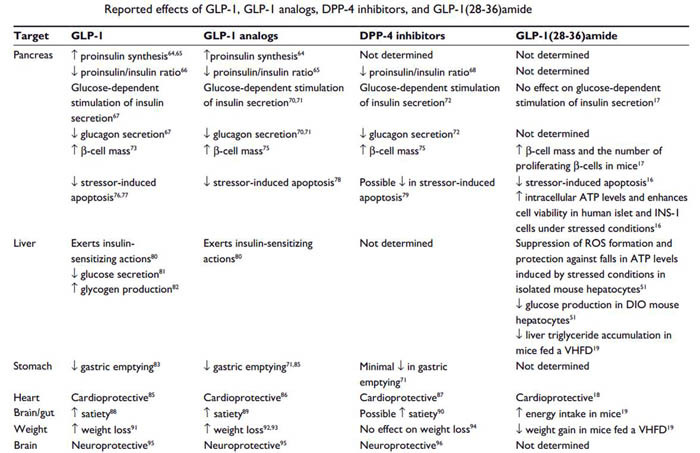 Increasing understanding of such noncanonical GLP-1 activities should help to improve future incretin-based therapeutics. Taing MW, Rose FJ, Whitehead JP, Drug Des Devel Ther. 2014 Jun 3;8:677-688. eCollection 2014. We have previously demonstrated in human subjects that under euglycemic clamp conditions GLP-1(9-36)amide infusions inhibit endogenous glucose production without substantial insulinotropic effects. 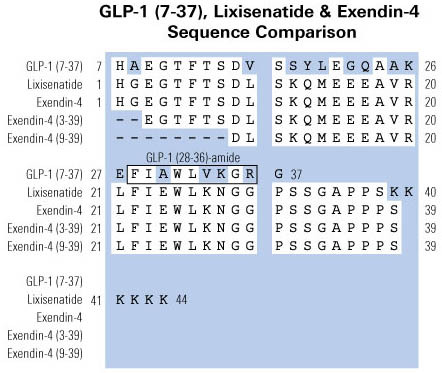 An earlier report indicates that GLP-1(9-36)amide is cleaved to a nonapeptide, GLP-1(28-36)amide and a pentapeptide GLP-1(32-36)amide (LVKGR amide). Here we study the effects of the pentapeptide on whole body glucose disposal during hyperglycemic clamp studies. Five dogs underwent indwelling catheterizations. Following recovery, the dogs underwent a 180min hyperglycemic clamp (basal glucose +98mg/dl) in a cross-over design. Saline or pentapeptide (30 pmol·kg-1·min-1) was infused during the last 120min after commencement of the hyperglycemic clamp in a primed continuous manner. During the last 30min of the pentapeptide infusion, glucose utilization (M) significantly increased to 21.4±2.9 mg·kg-1·min-1compared to M of 14.3±1.1 mg·kg-1·min-1 during the saline infusion (P=0.026, paired t-test; P=0.062, Mann-Whitney U test). During this interval, no significant differences in insulin (26.6±3.2 vs. 23.7± 2.5?U/ml, P=NS) or glucagon secretion (34.0±2.1 vs. 31.7±1.8pg/ml, P=NS) were observed. These findings demonstrate that under hyperglycemic clamp studies the pentapeptide modulates glucose metabolism by a stimulation of whole-body glucose disposal. Further, the findings suggest that the metabolic benefits previously observed during GLP-1(9-36)amide infusions in humans might be due, at least in part, to the metabolic effects of the pentapeptide that is cleaved from the pro-peptide, GLP-1(9-36)amide in the circulation. Glucagon-like peptide-1 (GLP-1) and its split products GLP-1(9-37) and GLP-1(28-37) stabilize atherosclerotic lesions in apoe-/- mice. BACKROUND: Glucagon-like peptide-1 (GLP-1) based therapies are new treatment options for patients with type 2 diabetes. Recent reports suggest vasoprotective actions of GLP-1. Similar beneficial effects might be reached by GLP-1(9-37) and the c-terminal GLP-1 split product (28-37) although both peptides do not activate the GLP-1 receptor. We therefore investigated the actions of GLP-1(7-37), GLP-1(9-37) as well as GLP-1(28-37) on vascular lesion formation in a mouse model of atherosclerosis. METHODS AND RESULTS: GLP-1(7-37), GLP-1(9-37) and GLP-1(28-37) and LacZ (control) were overexpressed for a period of 12 weeks in apoe(-/-) mice on high-fat diet (n = 10/group) using an adeno-associated viral vector system. Neither of the constructs changed overall lesion size. However,GLP-1(7-37), GLP-1(9-37) and GLP-1(28-37) significantly reduced plaque macrophage infiltration (GLP-1(7-37): 40.6%, GLP-1(9-37): 47.0%, GLP-1(28-37): 40.1% decrease, p < 0.05) and plaque MMP-9 expression (GLP-1(7-37): 41.6%, GLP-1(9-37): 50.2%, GLP-1(28-37): 44.0% decrease, p < 0.05) compared to LacZ in the aortic arch. Moreover, all GLP-1 constructs increased plaque collagen content (GLP-1(7-37): 49.3%, GLP-1(9-37): 86.0%, GLP-1(28-37): 81.9% increase, p < 0.05) and increased fibrous cap thickness (GLP-1(7-37): 188.0%, GLP-1(9-37): 179.9% GLP-1(28-37): 111.0% increase, p < 0.05). These effects of GLP-1(7-37), GLP-1(9-37) and GLP-1(28-37) on plaque macrophage infiltration, MMP-9 expression and plaque collagen content were confirmed in the aortic root. CONCLUSION: GLP-1(7-37), GLP-1(9-37) and GLP-1(28-37) reduce plaque inflammation and increase phenotypic characteristics of plaque stability in a murine model of atherosclerosis. Future studies are needed to determine whether these effects translate into improved plaque stability and less cardiovascular events in high-risk patients with type 2 diabetes. Burgmaier M, Liberman A, Möllmann J et al., Atherosclerosis. 2013 Dec;231(2):427-35. doi: 10.1016/j.atherosclerosis.2013.08.033. Epub 2013 Sep 5. GLP1-derived nonapeptide GLP1(28-36)amide protects pancreatic beta-cells from glucolipotoxicity. Type 2 diabetes, often associated with obesity, results from a deficiency of insulin production and action manifested in increased blood levels of glucose and lipids that further promote insulin resistance and impair insulin secretion. Glucolipotoxicity caused by elevated plasma glucose and lipid levels is a major cause of impaired glucose-stimulated insulin secretion from pancreatic ?-cells, due to increased oxidative stress, and insulin resistance. Glucagon-like peptide-1 (GLP1), an insulinotropic glucoincretin hormone, is known to promote ?-cell survival via its actions on its G-protein-coupled receptor on ?-cells. Here, we report that a nonapeptide, GLP1(28-36)amide, derived from the C-terminal domain of the insulinotropic GLP1, exerts cytoprotective actions on INS-1 ?-cells and on dispersed human islet cells in vitro in conditions of glucolipotoxicity and increased oxidative stress independently of the GLP1 receptor. The nonapeptide appears to enter preferably stressed, glucolipotoxic cells compared with normal unstressed cells. It targets mitochondria and improves impaired mitochondrial membrane potential, increases cellular ATP levels, inhibits cytochrome c release, caspase activation, and apoptosis, and enhances the viability and survival of INS-1 ?-cells. We propose that GLP1(28-36)amide might be useful in alleviating ?-cell stress and might improve ?-cell functions and survival. Liu Z, Stanojevic V, Brindamour LJ, Habener JF. J Endocrinol. 2012 May;213(2):143-54. doi: 10.1530/JOE-11-0328. Epub 2012 Mar 13. GLP-1-derived nonapeptide GLP-1(28-36)amide targets to mitochondria and suppresses glucose production and oxidative stress in isolated mouse hepatocytes. BACKGROUND: Uncontrolled hepatic glucose production (gluconeogenesis), and glycogenolysis, is a major contributor to the fasting hyperglycemia associated with type 2 diabetes. Here we report the discovery of a C-terminal nonapeptide (FIAWLVKGRamide) derived from GLP-1 that suppresses glucose production and oxidative stress in isolated mouse hepatocytes. The nonapeptide, GLP-1(28-36)amide, was reported earlier to be a major product derived from the cleavage of GLP-1 by the endopeptidase NEP 24.11. METHODS AND RESULTS: Hepatocytes were isolated from the livers of normal and diet-induced obese mice. We find that the GLP-1(28-36)amide nonapeptide rapidly enters isolated mouse hepatocytes by GLP-1 receptor-independent mechanisms, and targets to mitochondria where it inhibits gluconeogenesis and oxidative stress. CONCLUSIONS: These findings suggest that GLP-1 not only acts on a cell surface G-protein coupled receptor activating kinase-regulated signaling pathways, but a small C-terminal peptide derived from GLP-1 also enters cells, targets mitochondria, and exerts insulin-like actions by modulating oxidative phosphorylation. GLP-1(28-36)amide, or a peptide mimetic derived there from, might prove to be a useful treatment for fasting hyperglycemia and metabolic syndrome in type 2 diabetes. Tomas E, Stanojevic V, Habener JF. Regul Pept. 2011 Apr 11;167(2-3):177-84. doi: 10.1016/j.regpep.2011.01.003. Epub 2011 Jan 21. Figure from: Taing MW et. al. Drug Des Devel Ther. 2014 Jun 3;8:677-688. eCollection 2014. GLP-1(28-36)amide, the Glucagon-like peptide-1 metabolite: friend, foe, or pharmacological folly?